22 roses have no meaning whatsoever. But it is a beautiful number. 22 roses have no meaning whatsoever. But it is a beautiful number for beautiful recipient. 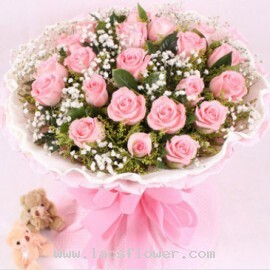 A bouquet of 22 pink roses accent with white gypsophila and beautiful foliage. Wrapped with pink paper and pink ribbon. The teddy bear does not include. The color of flowers and materials used can be changed. Occasionally, substitutions may be necessary to create your bouquet due to the availabil..
22 red roses arrange in a clear glass vase accents with white gypsophila flowers. We will add a beautiful ribbon on it. The color of roses can be changed as you wish. 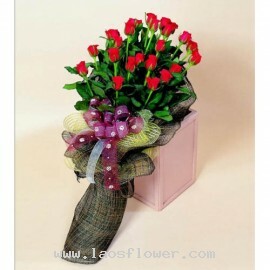 Occasionally, substitutions may be necessary to create your bouquet due to the availability of certain flowers in various parts of..
A bouquet of 22 red roses wrapped with a brown mesh material made of natural and tied with a ribbon * The color of roses and materials can be changed as you like. Informed us by email when ordering. Occasionally, substitutions may be necessary to create your bouquet due to the availability of cer..
A vases of 22 roses consists of 3 pink roses, 3 red roses, and 16 white roses accent with eucalyptus leaves and wrapped with crimson paper. This vase is a perfect gift for 22nd birthday or anniversary. The color of roses and paper can be changed. Please tell our staffs when ordering or by e-mail. 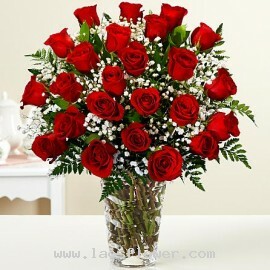 ..
A bouquet of 22 red roses in round shape accent with white gypsophila. Wrapped in white papers and red papers on the outside and tied with red ribbon. This bouquet is a perfect gift for 22 year old birthday. * The color of roses, paper, and ribbon can be changed. Occasionally, substitutions..